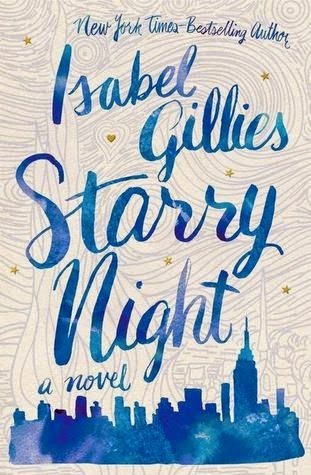 Isabel Gillies, a lifelong New Yorker and actress for many years, is the New York Times best selling author of Happens Every Day, A Year and Six Seconds and the upcoming Starry Night (FSG), a young adult novel about first love. Her work has been published in Vogue, The New York Times, Real Simple, Cosmopolitan and Saveur. She lives in Manhattan with her husband, kids and Maude the dog. Reviews for this book are all over the place, so I was a bit reluctant to read it. However, I know I need more YA in my repertoire and I love the cover, so I went with it. I felt like I was time-traveling into my past and looking through the eyes of my teenage self as I read this book. Wren is a young artist with ADD. She has a dynamic group of friends she's grown up with, her family is basically famous, and her brother makes friends with a dude she thinks is pretty fine. Mix in a fancy shmancy museum party, some late night mingling with attractive and successful people, and a few bad decisions among the posse and you've got Starry Night. All of the characters are in High School and pretty much all driven by hormones and blind dreams. I think that's what made this book feel real to me. It was exploding with the quirks and follies of teenagedom and I enjoyed every moment of it. I was totally that kid. It made me laugh at stupid things I thought and did back then. It blew little issues out of proportion, because back then everything did seem like a big deal, because you just haven't experienced the real world yet and nothing is really in perspective. When you're a teenager, your main concern is the person you like and whether people like you or not. Junior and Senior year you *might* start thinking about college and the rest of your life, but that's still only your #2 concern. This book totally brought me back to that time, and not only was I able to enjoy Wren's story and even all the heartbreak (because let's face it, most of us got our hearts broken by someone we thought was 'the one' in high school), but it also made me appreciate the fact that I went through all those things, because that's how I got to today. I don't care what they say, I liked this book. Starry Night is a light YA Chick Lit and is a perfect "beach book" or "just for fun" book. For those who enjoy books like The Selection Series by Kiera Cass or the Blood and Snow Series by RaShelle Workman will enjoy this book. There isn't really any fast-pace adventure or anything, but it is definitely a journey.